You searched for which does not fit your . We've redirected you to 115-024, which has the proper fitment. Great product. Keeps your head and neck warm. Fits easily under a helmet, too. Just don't wear it inside a bank ... they might wonder what you are up to. Great protection from the cold. love it. 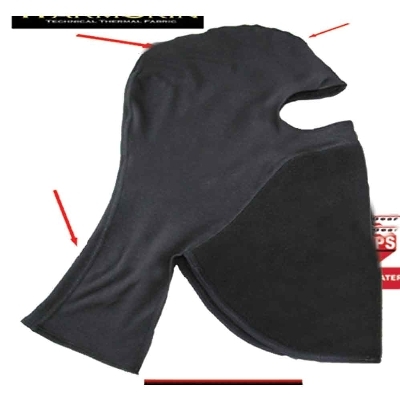 I have used other Balaclava's for cold weather riding, and this one is the best. The flap on the backside does a great job keeping the draft off the neck and from going down the back. Have worn it in mid-20 degree weather for couple hour rides. Definitely makes a difference. It fits very comfortably under my modular helmet. Wish I had this sooner. This balaclava is simply amazing. Even in cold rain my face is still dry and warm. The only turn off to this is rain leaked down my nose and got inside the mask and mixed with the wind blowing on the front, made a water tight seal over my face and I couldn't breath. Still trying to remedy this problem. It works. I ride in cold weather in Utah and it really keeps the heat in and me warm in the early morning on my way to work. It is great!